Joko Widodo was elected as Indonesia's president in July 2014, in a win that marked a sea change in the country's politics. Coming from a humble background, he stands in sharp contrast to the country's previous leaders, who hailed from the political and military elite. In 2014 Mr Widodo - more commonly known as Jokowi - stood on a "man of the people" anti-corruption platform, promising to tackle poverty and to stamp out nepotism and intolerance. He won decisively. But the race is not over. 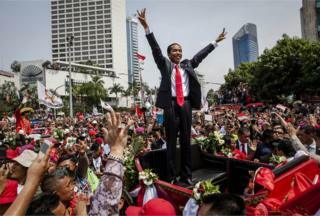 Mr Widodo will stand for election again this year against his long-time rival, Prabowo Subianto. Five years on from the last campaign, his one-of-us image has lost some of its sheen. Born in 1961 in Solo, a city in the centre of Java, Mr Widodo is the son of a wood-seller. The furniture-maker began his political career with the Indonesian Democratic Party of Struggle (PDIP) when he was elected mayor of Solo in 2005. Mr Widodo then ran to be Jakarta's governor, winning a resounding victory in 2012. He was seen to empathise with the poor and grew in popularity through measures such as relocating slum-dwellers and boosting small businesses. He first campaigned for the presidency on a platform of stamping out corruption, nepotism and intolerance - and pushed for investment in education, meritocracy and increased use of technology in governance. At Mr Widodo's inauguration in October 2014, he called for a spirit of unity and hard work, and promised to restore national pride as well as building a stronger maritime presence. Mr Widodo's administration had a somewhat shaky start. Critics warned that he lacked experience in national politics and international relations. His government rushed into some policies, such as banning the sale of alcohol in small shops and mandating Indonesian proficiency among foreign workers, only to backtrack on them later due to their unpopularity or unfeasibility. Mr Widodo's first international controversy came in April 2015 when he faced global pressure to pardon two Australian members of the Bali Nine drug smuggling ring, who faced death sentences. He refused, saying a hardline stance against drugs was necessary to protect Indonesia. In recent years, Mr Widodo has pushed to advance Indonesia's infrastructure - building roads, dams and railways. But in order to do it, he has welcomed Chinese investment and accepted loans and partnerships with foreign companies. His rival, Mr Prabowo, has accused him of selling out the country to foreigners, and opposition lawmakers claim Indonesia is facing an influx of Chinese workers. A long and occasionally violent history of anti-Chinese sentiment means these are contentious issues, especially in an election year. Indonesia has in recent years seen conservative religious groups grow increasingly vocal. Former Jakarta governor and Mr Widodo's ally Basuki Tjahaja Purnama, known more commonly as Ahok, was accused of blasphemy for comments he made during a pre-election speech in September 2016. After mass rallies in the streets, he was imprisoned for two years - seen as a setback for religious tolerance. Mr Widodo has shown that he is clearly aware of this rising trend, and has been working hard to display his Islamic credentials. Though he himself has been shown to be a religious moderate, he surprised many by picking Ma'ruf Amin as his running mate for the 2019 election. He's a powerful cleric who played a key role in the protests that led to Ahok's downfall. The move has been seen as an attempt to sway more conservative Muslim voters his way, but may have lost him some support among younger, liberal voters.